This stunning space wallpaper, not unlike a pointillist painting, shows the star-studded center of the Milky Way towards the constellation of Sagittarius. This stunning space wallpaper, not unlike a pointillist painting, shows the star-studded center of the Milky Way towards the constellation of Sagittarius. 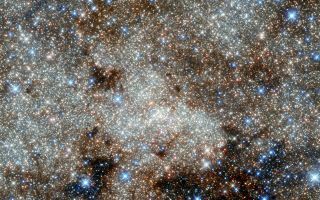 The crowded center of our galaxy contains numerous complex and mysterious objects that are usually hidden at optical wavelengths by clouds of dust — but many are visible here in these infrared observations from Hubble. However, the most famous cosmic object in this image still remains invisible: the monster at our galaxy’s heart called Sagittarius A*. This image was released Oct. 7, 2013.